I’m always fascinated by how ideas percolate up into the culture and become bona fide trends. An idea is sparked, acted upon, talked about…and suddenly everyone is doing it. The DIY trend is one example. While I was formulating the idea for DIY Delicious in early 2008, the social, economic, and political conditions that gave rise to the book were also working on other people’s psyches, but in different ways. The results: websites and businesses like Food in Jars, Punk Domestics, and Farm Curious, movements like Yes We Can, and Canning Across America, as well as countless books on DIY Dairy, canning, curing, and pickling. It’s as if these ideas are just floating out there in the ether waiting to alight on someone’s brain. The latest activity that has captured the imagination of cooks is food bartering. 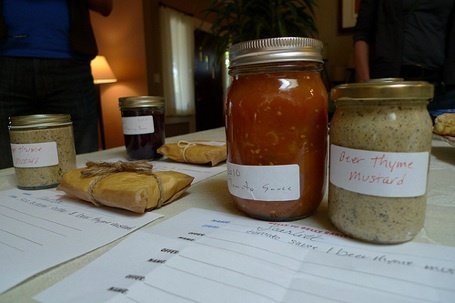 A couple weeks ago my friend Ellen emailed me with a full-blown plan for a barter market in which everyone would bring “lots” of homemade food (cheese, jam, sauerkraut, pickles, or anything) worth roughly $10 ea. to trade for “lots” of equal value with other participants. Her reasoning was that, while many of us are making many different food items, not everybody has the skills or inclination to make everything. For the price of your own expertise you can enjoy another’s artisanal, homemade goodies. Another goal: Sharing food is like glue. It strengthens our communities and fosters friendships and civility. How can we not recognize our commonalities when we gather to swap foods we’ve spent time and thought creating for the express purpose of sharing with others? Shortly after Ellen’s email, this article about Brooklyn food swaps appeared in the New York Times. Then, about two weeks before the event, I heard of another woman in North Oakland (where Ellen and I both live) organizing an Oakland swap the day BEFORE Ellen’s. Crazy that neither of us know this person. 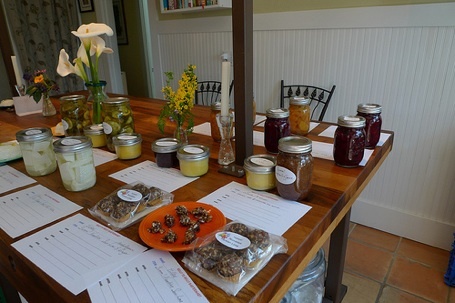 Then, one of our invitees was assigned to write about food swapping in the Bay Area by an editor at The Bay Citizen and before you know it, Ellen’s food swap hits the New York Times! Have you been bartering food formally or informally? What do you like about it? Tell me about it in the comments! 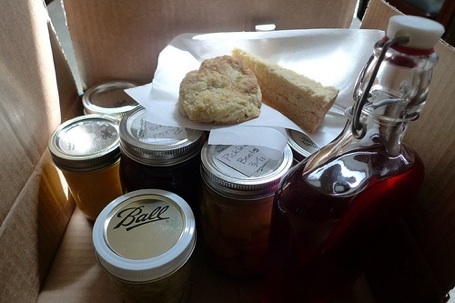 This entry was posted in Current Affairs, DIY, Food and Drink, community, entertaining, pantry staples and tagged Barter Mart, Belly to Belly, DIY, food bartering, food swaps, Oakland, self reliance, skill sharing, trading, urban homesteading. Bookmark the permalink. Post a comment or leave a trackback: Trackback URL. that is so dang exciting! I love barter systems. I don’t yet know how to can, pickle, etc, but am on a learning journey to incorporate those methods in my home. There’s just nothing like homemade food, and there’s nothing as wonderful as sharing it with others!